Okay, everyone, everyone, stop what you’re doing. Pilots, put your planes on autopilot. Surgeons, drop the scalpel and crank the anesthetic. Drivers, pull over. 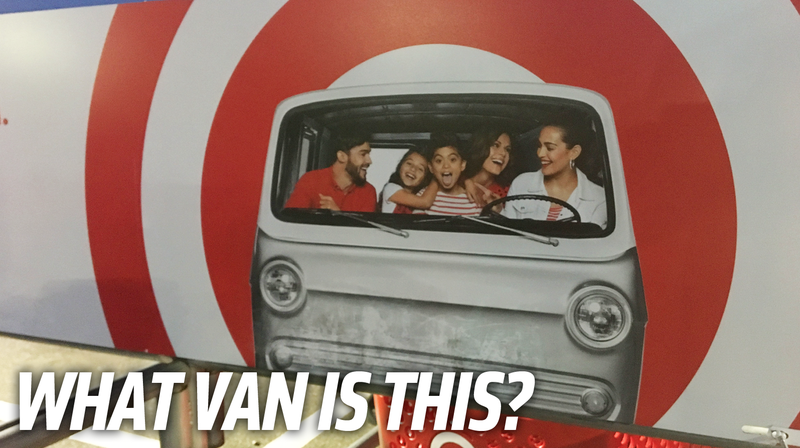 Everyone just get somewhere safe where you can concentrate, because we’re going to be identifying the van used on Target’s shopping cart return corrals. Try to remain calm. If you haven’t seen the sign yet, you should be able to see it at your local Target’s shopping cart return corral thing. You may wish to go visit one and set up a lawn chair so you can study the image at your leisure. The van in the image, improbably populated with an attractive family of five, all dressed in red-and-white, is white, or perhaps was actually just a black-and-white image, since the turn indicators don’t even seem to have a hint of amber behind those cloudy clear lenses. That detail is also important when evaluating the modifications Target’s designers made to the van, which appear to be focused on removing badges and any and all forms of ventilation or air intake. So that’s what Target’s designers must have been going for: the suggestion of a world where Chevrolet decided to spend less R&D money transforming the Corvair into a van. That seems pretty consistent with Target’s overall goals, right? What Car Did The Dad In Calvin & Hobbes Drive?